Limited edition sold in Fnac stores only. Issued to celebrate 25th anniversary of the single "Désenchantée". 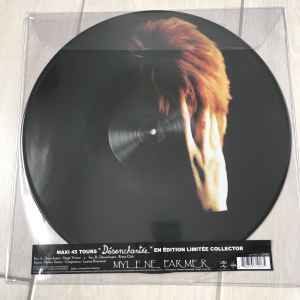 Unlike the 12'' single issued in 1991, this Picture Disc release includes the 2001 remastered version (and not single version as indicated on sticker) instead of the "Chaos Mix". The remastered version from 2001 was originally done for Mylène Farmer's greatest hits album "Les Mots". It has a different bridge with background vocals (the single version has a 100% instrumental bridge) and a slightly longer chorus at the end of the song.